The Inaugural Ralph Summy Lecture: What sort of country are we? What sort of country can we be? Today’s talk is given in honour of Professor Ralph Summy. Professor Summy taught political science at the University of Queensland for more than 30 years. He established an interdisciplinary major in peace and conflict studies. In 1971 he wrote a thesis called Australian Peace Movement 1960-67: A Study of Dissent. He wrote it for the purpose of a Master of Arts at the University of Sydney. It is an interesting thesis because it covers the history of a movement of which I was vaguely aware during my years of blind passivity. The period covered by his study begins in 1960 (when I was in Grade 6 at school, and hopefully I can be forgiven for not paying attention to what was going on) and ends in 1967, which was my first year at university and had become vaguely aware of things that were happening. The big name in political activism during the years that I remember included Jim Cairns. Jim Cairns gets numerous references in Ralph Summy’s thesis. It is easy to forget these days that the big issues back then included the nuclear arms race, the war in Vietnam and (in Australia specifically) conscription. I was acutely aware of the war in Vietnam and conscription because my birth date had come out of the ballot, by which people were chosen for conscription, and because I was a university student when I turned 18 I was able to defer my call-up until I finished my degrees. I finished at university in 1972. The Federal election that year was fought at least in part on the issue of conscription, and I was due to be called-up at the start of the following year. But Gough Whitlam won that election, and had promised during his election campaign to abolish conscription. He did so and as a result I wasn’t called up. That was a relief, of course. But it has to be conceded that I had voted against self-interest in December 1967, because I voted Liberal. It is easy to forget that the 1966 election followed shortly after Harold Holt (who was then Australia’s Prime Minister) had said that Australia would go “all the way with LBJ”. It is also easy to forget that Holt had been given the Prime Ministership by Sir Robert Menzies, who had begun his record run as Prime Minister of Australia in 1949 (the year I was born – I didn’t catch up with the news until a bit later) and Liberals continued to hold government in Canberra until 1972. Ralph Summy’s thesis includes the useful reminder that a Victorian SOS pamphlet included this sentence: “Why … the Menzies-Holt government committed Australian troops is because the government believes that Australia must blindly follow American policies in order to consolidate the Australian-American alliance, which the government regards as necessary to Australian security”. The catchcry “all the way with LBJ” was universally recognized in Australia, although it originated in America. In March 1964, Democrat Party supporters in New Hampshire called “all the way with LBJ and RFK”. In October 1966, LBJ visited Australia and Harold Holt declared that Australia was “all the way with LBJ”. Holt had been treasurer until January 1966, when Robert Menzies stepped down as Prime Minister and handed over to Holt. Holt was sworn in as Prime Minister on Australia Day 1966. (Interestingly, his first Cabinet included Billy McMahon, John Gorton and Malcolm Fraser). LBJ’s visit to Australia was usefully timed in October 1966, because the Federal election was held in November that year. Holt’s declaration that Australia would go “all the way with LBJ” was wildly contentious, because of course it was a direct reference to Australia’s continued involvement in the war in Vietnam. Holt disappeared in late December 1967, presumably drowned at sea near his beach-house at Portsea. So, his big issue and his death fit neatly into Ralph Summy’s thesis. Arthur Calwell in a motion of dissent from the policies outlined by Harold Holt in his first statement as Prime Minister, noted as the first item “emphatic opposition to the dispatch of conscripted youths for service in Vietnam”. Summy’s thesis notes that the Parliamentary party of the ALP had made known in May 1966 that conscription would be a major issue in the election later that year. It is easy to forget what a contentious issue conscription and the war in Vietnam had been. It is altogether fitting that this speech is in honour of Ralph Summy, whose thesis provides such a powerful reminder of the simple truth that political activism can ultimately achieve results. Tonight, we honour Ralph Summy. Because Ralph Summy was an activist, and because the Australian Activists Award is to be presented tonight, I was asked to keep my talk largely upbeat. After all, activists should not be discouraged. It will be no surprise to anyone here that occasionally I find it difficult to remain upbeat in my pursuit of something approximating justice for refugees in Australia. However, it is important to notice that political activism sometimes takes a while to meet its mark (for example, the activism summarized by Ralph Summy and which was in large part responsible for the end of conscription and the end of Australia’s involvement in the Vietnam War). And equally it is important to notice that various other forms of political activism have also produced striking and enduring results – results which should still be celebrated. The cause of human rights often advances and then slips back. We are in a slippage phase at present. My general proposition tonight is that the slippage phases should not discourage us: taken in the long sweep of history, the activists are helping humankind make progress. Although I am sure there are many earlier examples, it is useful to start with Thucydides’ History of the Peloponnesian Wars. The second Peloponnesian war ran from 431BC until 404BC. Athens wasn’t doing too well and decided that it needed a launching place somewhere close to Sparta. The island of Melos was an ideal candidate. But the island of Melos had never done anything to harm the Athenians and was, in all possible respects, a neutral. The Athenians sent a delegation to speak to the commissions of Melos and explained to them fairly bluntly that they were planning to take over Melos and that there was an easy way and a hard way. They acknowledged that the Melians had never done any harm to the Athenians but then pointed out that this was irrelevant “You know as well as we do” they said “that justice is only relevant between equals in power. Where power is unequal, the strong do what they will and the weak suffer what they must” (the Melians stood their ground and Athens took them over the hard way: they murdered the men and raped the women). Although it is easy to be cynical about our conceptions of justice, the legal system still aims to achieve justice and in particular justice of a kind which does not depend on whether the antagonists are equal in power or one weak and the other strong. It may not be a perfect system, but at least its objectives have taken us some distance from the theoretical underpinnings and harsh consequences of the Melian dialogue. Let me give another example of progress. It is easily forgotten how differently slaves were seen before the heroic and pioneering work of William Wilberforce in the late 18th and early 19th Centuries. Before Wilberforce started campaigning against slavery, slavery was common and accepted and, in some places at least, was regarded as fundamental to the continued economic prosperity of the British Commonwealth. In 1781, a ship variously called The Zorg or The Zong (one appears to be a misreading of the other) set sail from the coast of West Africa, bound for Jamaica. The captain was Sir Luke Collingwood. As was the custom at the time, its cargo was fully insured. The cargo comprised 470 slaves. Because of faulty navigation and changes in the weather, supplies of food and water on the ship looked as though they might not last the distance. By the 29th November 1781, overcrowding together with malnutrition and disease had resulted in the deaths of seven crew members and about 60 slaves. Captain Collingwood decided to throw a further 133 slaves overboard. By that extreme measure, he hoped that the remaining food and water would be sufficient for the balance of the voyage. “What is this claim that human people have been thrown overboard? This is a case of chattels or goods. Blacks are goods and property; it is madness to accuse these well-serving honourable men of murder. They acted out of necessity and in the most appropriate manner for the cause… The case is the same as if horses had been thrown overboard”. The case of The Zorg is one which is almost inconceivable in modern times. In that simple proposition, you see that we have, in fact, made some progress in our conceptions of justice. William Wilberforce was a great activist and although it took a long time he succeeded. It is easy to forget that, at least until the English Civil War, the received theory of Government was that Kings ruled by divine right and they could not safely be removed. The English Civil War (1642-1647) was the result of growing tension between King Charles I and his Parliament but it had not been fought when the British colonized North America by establishing a settlement at Jamestown, Virginia in 1607. By 1773, the Americans had tired of being taxed by a British Government in which they had no say. Their direct expression of discontent was called the Boston Tea Party. “When in the course of human events, it becomes necessary for one people to dissolve the political bands which have connected them with another, and to assume among the powers of the earth, the separate and equal station to which the laws of nature and of nature’s god entitlement, a decent respect to the opinions of mankind requires that they should declare the causes which impel them to the separation. The reference to “life, liberty and the pursuit of happiness” is widely known and universally famous. But the simple explanation of the nature of government and the source of power to form government is often overlooked but was truly revolutionary. Even though some of the large objectives of the preamble to the Declaration of Independence have not yet been achieved, it has to be said that it was a great triumph and a step in the right direction. When I say that not all the objectives had been achieved, I have in mind in particular the case of Dred Scott. The Declaration of Independence was a truly revolutionary act, the result of years of careful thinking and calculated activism. 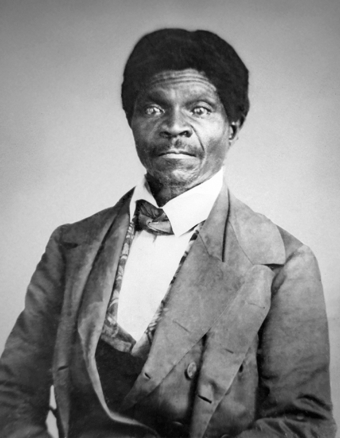 Dred Scott was born a slave in Virginia, in 1799. He was owned by Peter Blow. The Blow family moved to St Louis, Missouri, in 1830. Missouri had been acquired in 1804 in the Louisiana purchase. It had been admitted to the Union in 1820, as a slave State, as part of the Missouri Compromise. The Missouri Compromise allowed Missouri into the Union as a slave State, but otherwise prevented the admission to the Union of slave States above 36º30’ north latitude. In effect, it guaranteed that slavery would not spread to the other States acquired in the Louisiana Purchase. It had been a hotly contested measure. Since Eli Whitney had invented the cotton gin in 1794, cotton had been a great source of wealth in the southern States, but its profitability depended on slave labour to pick the cotton. In 1830, Blow sold Scott to Dr Emerson, an army surgeon. Emerson took Scott with him to his various postings. They spent the next 12 years in free States, principally Illinois. They returned to St Louis in 1842. Emerson died in 1846. His executors were his wife, and her brother John Sanford. Judge Alexander Hamilton heard Scott’s case. A technicality in the evidence led to its failing. The Judge granted leave for a new trial. He won; but the decision was reversed by the Missouri Supreme Court in 1852. By this time, Mrs Emerson had remarried. Her new husband was an abolitionist. She made over Scott to her brother and co-executor, John Sanford. Sanford lived in New York. Thus, Scott was able to sue in the Federal jurisdiction, since the suit was between residents of different States. The action was for assault. Sanford (erroneously called Sandford in the Court record) filed a plea in abatement on the basis that Scott was a slave and therefore not a citizen. Accordingly, so the argument went, there was no suit "between citizens of several States" and the Federal jurisdiction was not attracted. In other words, he sought to have the action struck out peremptorily as incompetent. The matter was argued in December 1855, and was re-argued in 1856. Powerful interests wanted to retain the institution of slavery: American plantation owners, as well as English manufacturers and merchants. Slavery had been abolished in Britain and its Colonies by the Emancipation Act 1834, but that did not prevent English commerce from benefitting from it indirectly. Such was still the position when Roger Casement undertook his tour of investigation in the Congo Free State (1901-04), and Brazil (1906-11). The first question in issue resolved to this: was a slave capable of being a citizen under the Constitution, so that his action against a citizen of another State would attract the Federal jurisdiction?
" … We hold these truths to be self-evident, that all men are created equal, that they are endowed by their Creator with certain unalienable Rights, that among these are Life, Liberty and the pursuit of Happiness." "The general words above quoted would seem to embrace the whole human family, and if they were used in a similar instrument at this day would be so understood. But it is too clear for dispute that the enslaved African race were not intended to be included … for if the language, as understood in that day, would embrace them, the conduct of the distinguished men who framed the Declaration of Independence would have been utterly and flagrantly inconsistent with the principles they asserted …"
"In the argument, it was said that a colored citizen would not be an agreeable member of society. This is more a matter of taste than of law. Several of the States have admitted persons of color to the right of suffrage, and, in this view, have recognised them as citizens, and this has been done in the slave as well as the free States. On the question of citizenship, it must be admitted that we have not been very fastidious. Under the late treaty with Mexico, we have made citizens of all grades, combinations, and colors. The same was done in the admission of Louisiana and Florida …" (per McLean J at 533). Curtis J (dissenting) found in the words of the Constitution ample authority for the proposition that a slave could be a citizen of the United States. The second question was whether a slave could become a free man by entering a free State. "No person shall … be deprived of life, liberty, or property, without due process of law; nor shall private property be taken for public use without just compensation." To allow that a slave be freed by virtue of travelling to a free State would involve a deprivation of property without due process. It is an interesting irony that a slave owner could not be deprived of ownership of his slave without due process, but the slaves were deprived of liberty without due process. The relevant difference is that slaves were not considered "people" for Constitutional purposes. For good measure, 6 of the 7 judges in the majority held the Missouri Compromise to be unconstitutional, as contravening the 5th Amendment. Thus, they struck down the measure which had, in effect, quarantined slavery to the southern States where the cotton industry was the principal source of wealth, and slave labour was the principal engine of that industry. The Dred Scott case [reported under the name Scott v Sandford 60 US 393] was decided by the US Supreme Court on 6 March 1857. It provoked bitter controversy. "Four score and seven years ago our fathers brought forth on this continent a new nation, conceived in Liberty, and dedicated to the proposition that all men are created equal. …"
In so saying, he was unequivocally advancing the cause of abolition. His address at Gettysburg is regarded as a clarion call for the abolitionist cause. The Dred Scott case resulted in the resignation of Curtis J, and blighted the reputation of Taney J. He was a decent man and a fine lawyer. He had voluntarily freed his own slaves, at great personal cost, and had 35 years earlier described slavery as "a blot on our national character". Ironically, the decision in the Dred Scott case is generally regarded as a blot on the record of the US Supreme Court. The decision was an exercise in strict construction which reached an unpalatable result by chaining the words of the Constitution to their historic origins. In 1992 Scalia J. - himself no bleeding-heart liberal in matters of construction - said that “… the Court was covered with dishonour and deprived of legitimacy” by the Dred Scott decision. On 28 July 1868, in the aftermath of the Civil War, the effect of the decision was overturned by the 14th amendment to the US Constitution. The French Revolution started in 1789. The Declaration of the Rights of Man and the Citizen was prepared at about the same time. It is not surprising to learn that Thomas Jefferson had a hand in drafting it. It was influenced by the political philosophy of the Enlightenment and principles of human rights, as the U.S. Declaration of Independence was. Jefferson had prepared the first draft of the Declaration of Independence. For all this, it is worth noticing that these principles expressly did not apply to women or slaves. And it is worth noting that in 1791 Olympe de Gouge prepared the Declaration of the Rights of Woman. The following year she was executed by guillotine. The next giant step forward resulting from activism which I would identify did not happen until the middle of the 20th Century, although I am sure there were plenty of other significant advances between 1776 and 1948. It is widely forgotten that anti-Semitism was common through the Western world until the end of the Second World War. Arguably, anti-Semitism hasn’t disappeared but has simply gone underground. There are clear traces of anti-Semitism in the earliest version of Magna Carta. There are clear instances of anti-Semitism in Shakespeare, notoriously in the Merchant of Venice. But the horrors of the holocaust gave anti-Semitism the bad name it always deserved. The Second World War gave rise to a new need to protect human rights. After the war ended, it was impossible – indecent – to permit a continuation of the anti-Semitism which has disfigured many countries (including England and Australia). The holocaust showed where that line of thinking leads if left unchecked. The Universal Declaration of Human Rights in 1948 and the Refugees’ Convention in 1951 were the most prominent expressions of a new global concern to see that those who fear persecution should be protected. The Universal Declaration (10 December 1948) was the work of a surprising activist: Eleanor Roosevelt. She was the widow of Franklin Delano Roosevelt who had died shortly before the end of the Second World War. She was also cousin to Roosevelt and had grown up in the rich surroundings of the Roosevelt family. But Eleanor Roosevelt was a genuine egalitarian and had set her heart on responding decisively to the horrors of the Second World War. When I say Eleanor Roosevelt was a true egalitarian, it is worth remembering that from the death of FDR in 1945 until her death in 1962, Eleanor Roosevelt spent most of her time at a small property called Val-Kill in upstate New York. Val-Kill is truly remarkable in a number of ways. It is strikingly plain. It is a very simple old farmhouse. The sitting-room is furnished with very ordinary chairs and very simple bookshelves. But there are photographs on the wall one of which is a photograph of Eleanor Roosevelt having tea in that very room with John F. Kennedy. Next to the sitting-room is the dining-room. The dining-room table seats 10 or 12 people. Many great heads of state dined at that table. But Eleanor Roosevelt was always conscious of the need to have equal numbers of locals whenever she was entertaining dignitaries. And the crockery on which dinner was served had been bought at a Five and Dime store. Eleanor Roosevelt must have been a truly remarkable person. Her sense of the equality of all human beings still lives and breathes at Val-Kill. As with the Declaration of Independence, some of the rhetoric goes beyond what has ultimately been achieved but it remains the case that for such a document to be universally acknowledged in the United Nations is a mark of progress to which all activists can aspire. The Trevorrow case happened half a world away, and 150 years later. Bruce Trevorrow was the illegitimate son of Joe Trevorrow and Thora Lampard. He was born in November 1956. They lived at One Mile Camp, Meningie, on the Coorong. They had two other sons, Tom and George Trevorrow. They lived at One Mile Camp because, in the 1950s, it was not lawful for an aborigine to live closer than one mile to a place of white settlement, unless they had a permit. When Bruce was 13 months old, he got gastroenteritis. Joe didn’t have a car capable of taking Bruce to the hospital, so some neighbours from Meningie took him to the Adelaide Children’s Hospital where he was admitted on Christmas Day 1957. Hospital records show that he was diagnosed with gastroenteritis, he was treated appropriately and the gastro resolved within six or seven days. Seven days after that he was given away to a white family: Mr & Mrs Davies. The Davies lived in suburban Adelaide. They had a daughter who was about 16 at the time. She gave evidence at the trial as a woman in her late middle age. She remembered the day clearly. Her mother had always wanted a second daughter. They had seen an advertisement in the local newspaper offering aboriginal babies for fostering. They went to the hospital and looked at a number of eligible babies and saw a cute little girl with curly hair and chose her. They took her home and, when they changed her nappy, they discovered she was a boy. That’s how Bruce Trevorrow was given away in early January 1958. A short time later Bruce’s mother, down at One Mile Camp Meningie, wrote to the Department asking how Bruce was doing and when he was coming home. The magnitude of her task should not be overlooked: pen and paper, envelope and stamp were not items readily obtained in the tin and sackcloth humpies of One Mile Camp, Meningie. But Thora managed to write her letter, and it still exists in the South Australian State archives. The reply is still in existence. It notes that Bruce is doing quite well but that the doctors say he is not yet well enough to come home. Bruce had been given away weeks earlier. In South Australia in the 1950s, the laws relating to fostering required that foster mothers be assessed for suitability and that the foster child and foster home should be inspected regularly. Although the laws did not distinguish between white children and aboriginal children, the fact is that Bruce’s foster family was never checked for suitability and neither was he checked by the Department to assess his progress. He came to the attention of the Children’s Hospital again when he was three years old: he was pulling his own hair out. When he was eight or nine years old, he was seen a number of times by the Child Guidance Clinic and was diagnosed as profoundly anxious and depressed and as having no sense of his own identity. Nothing had been done to prepare the foster family for the challenges associated with fostering a young aboriginal child. When Bruce was 10 years old, he met Thora, his natural mother, for the first time. Although the Department had previously prevented his mother from finding out where Bruce was, the law had changed in the meantime and they could no longer prevent the mother from seeing him. The initial meeting interested Bruce and he was later to be sent down to stay with his natural family for a short holiday. When the welfare worker put him on the bus to send him down to Victor Harbour, the foster mother said that she couldn’t cope with him and did not want him back. His clothes and toys were posted on after him. Nothing had been done to prepare Bruce or his natural family for the realities of meeting again after nine years. Things went badly. Bruce tried to walk from Victor Harbour back to Adelaide (about 80 kilometers) to find the only family he knew. He was picked up by the police and ended up spending the next six or eight years of his life in State care. By the time he left State care at age 18, he was an alcoholic. The next 30 years of his life were characteristic of someone who is profoundly depressed and who uses alcohol as a way of shielding himself from life’s realities. He had regular bouts of unemployment and a number of convictions for low-level criminal offences. Every time he was assessed by a psychiatrist, the diagnosis was the same: anxiety, profound depression, no sense of identity and no sense of belonging anywhere. The trial had many striking features. One was the astonishing difference between Bruce – profoundly damaged, depressed and broken – and his brothers, who had not been removed. They told of growing up with Joe Trevorrow, who taught them how to track and hunt, how to use plants for medicine, how to fish. He impressed on them the need for proper schooling. They spoke of growing up in physically wretched circumstances, but loved and valued and supported. They presented as strong, resilient, resourceful people. Their arrival to give evidence at the trial was delayed because they had been overseas attending an international meeting concerning the repatriation of indigenous remains. That finding was not only supported by evidence, it also accords with common sense. We all have an instinct that it is harmful to children to remove them from their parents. The finding was based on extensive evidence concerning the work of John Bowlby in the early 1950s, which showed that it is intrinsically harmful to remove a child from his or her parents, in particular when this occurs after nine months of age. After a hard-fought trial, the Judge found in Bruce’s favour, and awarded him a total of about $800,000. There are a few things to say about this. First, Bruce’s circumstances were not unique. There are, inevitably, other aboriginal men and women who were taken in equivalent circumstances while they were children and suffered as a result. Although they may seek to vindicate their rights, the task becomes more difficult as each year passes. Evidence degrades, witnesses die, documents disappear. Second, litigation against a Government is not for the fainthearted. Governments fight hard. It took Bruce’s case eight years to get to court, and the trial ran for some months. If he had lost the case, Bruce would have been ruined by an order to pay the Government’s legal costs. “Today we honour the indigenous peoples of this land, the oldest continuing cultures in human history. For the pain, suffering and hurt of these stolen generations, their descendants and for their families left behind, we say ‘sorry’. To the mothers and the fathers, the brothers and the sisters, for the breaking up of families and communities, we say ‘sorry’. 13 February 2008 will be remembered as a day the nation shifted, perceptibly.